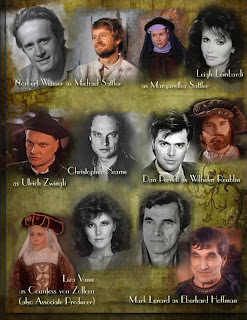 THE RADICALS is an expansive, historically accurate, independently-financed feature film which presents the never-before-told true story of the first church formed during the Reformation. Shot entirely on location in France, Switzerland and Germany, THE RADICALS was honored as one of the three best American motion pictures produced in the 1990s by the International Festival for the Arts. (The other two were SCHINDLER'S LIST and GETTYSBURG). In addition, it was selected as the "Best Religious Film of the Year" by The Religious Public Relations Council of America. Other awards include top honors at film festivals ranging from Tokyo to Ghent to Houston. Now, two decades later, the immensely talented Jane Bohon has published a 20th Anniversary Tribute commemorating the making of THE RADICALS. It is perhaps the most extensive publication of its kind for a relatively low budget, independent production. 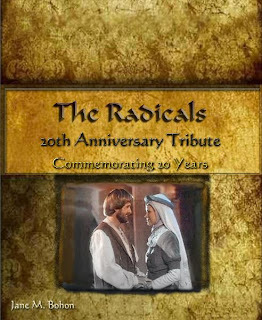 On behalf of everyone associated with THE RADICALS allow me to convey to Ms. Bohon our sincere appreciation for all the hard work, the incredible commitment and the undying dedication in making this 20th Anniversary something truly special. Thanks Jane -- you're the best!